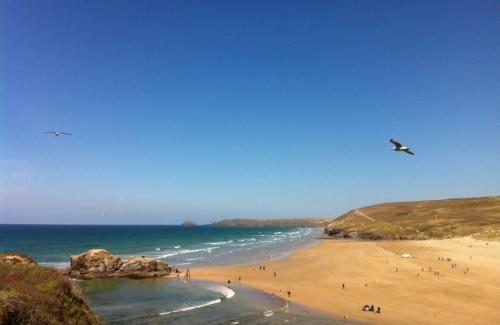 With three miles of beautiful, golden sands, Perranporth beach is a spectacular playground for the whole family. Build sandcastles, play football or explore the countless rock pools (please leave the little creatures where they are!). Take a swim in the natural tidal pool at Chapel Rock, have a picnic, take a stroll, or at sunset... why not enjoy a glass of wine or fine Cornish Ale at the 'Watering Hole' Bar?... the perfect place to watch the sun go down at the end of the day! Here in Perranporth, we are also blessed with some of the best waves in the country. The Atlantic surf attracts surfers all year around looking for beautiful waves and clear waters. For more information on surfing or if you would like to check out the local conditions today, please take a look at our 'Surfing' page. Annual events hosted on the beach include the "Tunes In The Dunes" music festival, Beach Cricket, Beach Tag Rugby , Perranporth Triathlon and The English National Surfing Championships. As you walk North along Perranporth beach, you will see the spectacular sand dunes of Penhale Sands. This area is a designated Site of Special Scientific Interest (SSSI) and a Special Area of Conservation (SAC). The Sand Dune systems are one of the rarest habitats in Britain and support a huge variety of specialised plants and wildlife. Human interference can however easily damage these habitats so please keep to the paths to allow this special area to thrive.